Marc Chagall’s three monumental portraits from 1914, Jew in Red, Jew in Black and White, and Jew in Green, are on view in Gauguin to Picasso: Masterworks from Switzerland. Read more about Jew in Black and White here, and Jew in Green here. 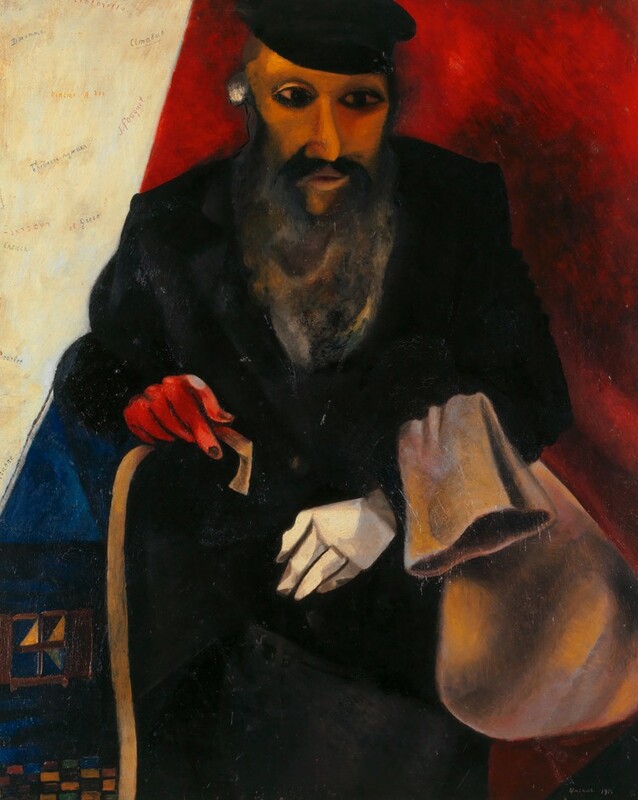 Chagall’s Jew in Red is a bearded man holding a cane and a bag of belongings. He has been interpreted as Ahasver, the eternal Wandering Jew, or perhaps even Chagall, the displaced artist—a foreigner in his homeland. On the white curtain at left, in Hebrew, Latin, and Cyrillic, are names of artists that Chagall admired in Paris: Paul Cézanne, Gustave Courbet, Jean-Baptiste-Siméon Chardin, El Greco, Pieter Brueghel the Elder, Jean Fouquet, Vincent van Gogh, Cimabue, Giotto, and Tintoretto. Marc Chagall’s three monumental portraits from 1914, Jew in Red, Jew in Black and White, and Jew in Green, are on view in Gauguin to Picasso: Masterworks from Switzerland. Read more about Jew in Black and White here. 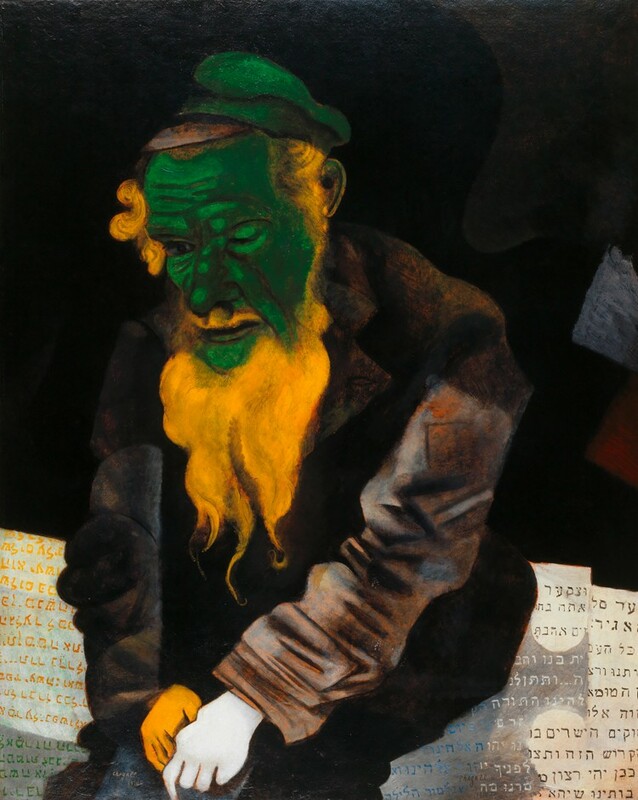 The model for Jew in Green, a rabbi who introduced himself as the Preacher of Slouzk, left a profound effect on Chagall. He explained, “I had the impression that the old man was green; perhaps a shadow fell on him from my heart.” Chagall depicted him impoverished and in despair, with one eye open, the other closed, and his hands painted in different colors. Behind him are religious texts he recited daily in Hebrew, including the Kaddish, a prayer praising God: “He Who makes peace in His heights, may He make peace for us and for all Israel.” In 1936, Karl Im Obersteg acquired Jew in Green from Chagall by trading it for another picture by the artist. Marc Chagall’s three monumental portraits from 1914, Jew in Red, Jew in Black and White, and Jew in Green, are on view in Gauguin to Picasso: Masterworks from Switzerland. 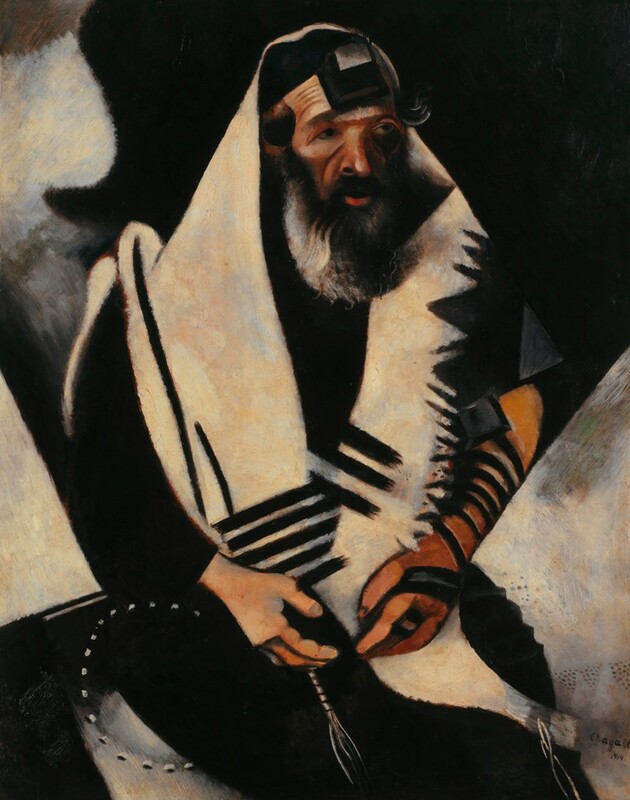 Chagall dressed him as a rabbi, placing his father’s tallit (prayer shawl) over the man’s shoulders and wrapping tefillins (used during morning prayer) around his head and left arm. His right hand holds the tzitzit (tassel of the prayer shawl). Jew in Black and White and Jew in Red were exhibited in Chagall’s 1933 retrospective at the Kunsthalle Basel, which collector Karl Im Obersteg, through his association with the artist, helped to organize. This painting is the first of two later versions in separate collections.